Renovation from "House and Garden Paepke"
With the promotion of a Loop Outdoor-Table from Willy Guhl, Connox supports the renovation of the landmarked “House and Garden Paepke” (Haus und Garten Paepke). The property is considered to be a prime example for the architecture of the post-war time. The costly renovation is planed this year. The replacement of the original furniture is connected to this project. With a so called promoting partnership, Connox Living Design is involved in the renovation offering a specimen of the Loop Outdoor Table from Willy Guhl. The original table was coined in the 1950es and was overworked by Willy Guhl himself. The table that emerged together with the suitable Loop Outdoor Armchair is manufactured by the Eternit AG today. 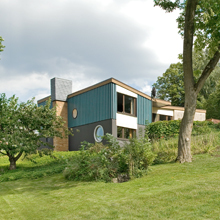 “House and Garden Paepke” was designed and built between 1958 and 1960 by Prof. Hermann Mattern for the Paepke family. It still was in the family property until 2007 and was sold to Mark Meusel after a year of vacancy. Since 2009 house and garden are landmarked. Regarding the 40th day of death from the architect Hermann Mattern on the 17th of November 2011 and the 325 year Carlsdorfs celebration in the same year, a costly renovation from the house and the garage is planed. Thereby it is necessary to remove damages at the buildings and to repair urgent parts to safe the substance for a long time. The house and the additional garden have grown a bit old, but in the essence they are still in the original state. In tight cooperation with the state office for the preservation of monuments Hessen, the architects as well as the working craftsmanship, it should be reconstructed wherever it is possible and the ancient details solutions should be achieved. The available furniture is going to be worked out; missing pieces will be reconstructed or replaced by authorized re-editions. Further information and pictures to “House and Garden Paepke” on the homepage of the property.